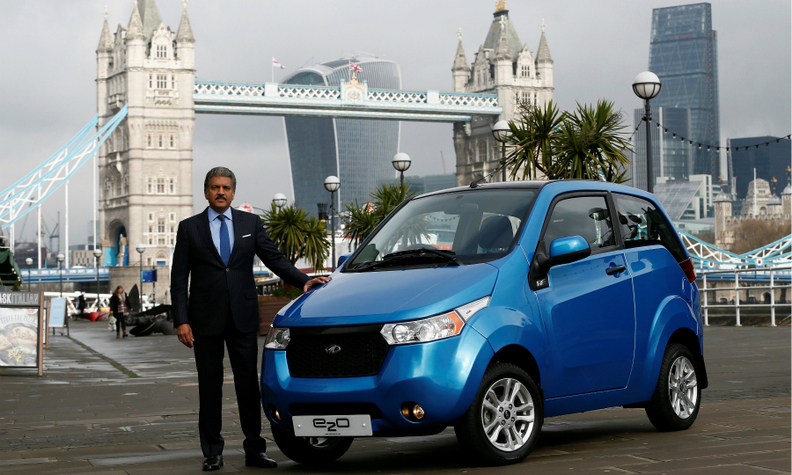 Mahindra Chairman Anand Mahindra poses with a Mahindra e2o EV during its launch in London in 2016. LONDON/NEW DELHI -- Mahindra & Mahindra has stopped selling electric cars in the UK due to weak demand and is winding up sales operations there, according to a document seen by Reuters, in a new setback to the Indian automaker's global ambitions. Mahindra's decision comes less than a year after it launched the e2o car in a market it considered a launchpad for selling EVs in European countries like Norway, Sweden and the Netherlands. "Immediately post-Brexit, the e2o has not met the desired sales targets as per the plans for the UK market," a Mahindra spokesman said in an emailed response, without explaining how the UK's decision to leave the European Union hurt sales. Dubbed as India's Tesla, Mahindra sells the e2o in its home market and in the neighboring countries of Nepal and Bhutan. Like in the UK, Mahindra has struggled to significantly ramp up sales of electric cars in India in part because of the lack of charging stations and low buyer interest. The move is a new setback for the company, part of the $17 billion Mahindra group, which struggled to enter the U.S. a decade ago despite spending about $100 million on launch plans. More recently, it was forced to stop selling pickup trucks and SUVs in Brazil in 2015 due to a sluggish economy and changes in local regulation. Mahindra, in the letter, said it has stopped the sale of all e2o cars in the UK with immediate effect, cancelled all pending orders and is buying back cars from existing customers at the price they paid for it. "It is with great sadness that we have had to make this decision, but ultimately the level of interest in the vehicle and the extremely low volume of sales has left us with no alternative," the company said. While Mahindra blames Brexit for its performance, car sales in the UK have continued to rise despite forecasts that demand would be hit by the UK's decision to leave the EU.